When my parents were in their early forties, they resigned themselves to never having a child. And then the next thing they knew, they were expecting me. We haunted our school library and the Fallingbrook Public Library for new and exotic recipes. We found other things there, too, like great books to read. And boys. There were boys in those libraries. Cookbooks took us there, but boys kept us there. We weren't sure what those boys were studying, but we since we were studying them, we couldn't help hoping that they were studying us. We tried not to giggle. All of us came back to Fallingbrook after we finished our education. I was a 911 dispatcher for awhile. Now I run a donut and coffee shop, Misty is a police officer, and Samantha is an Emergency Services Technician. The three of us get together frequently. Our meals are always delicious and our kitchens never get too messy. 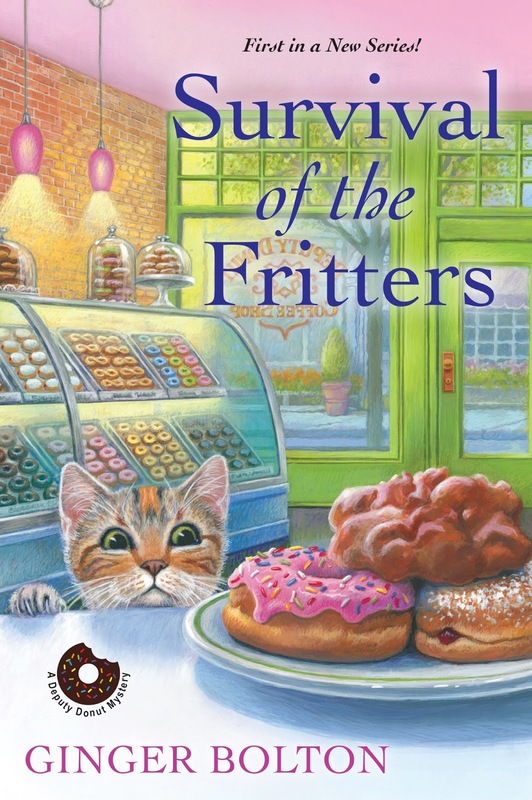 You can read about Emily and her friends (and Emily's cat, Dep) and how they helped solve a murder in Survival of the Fritters. In September, Goodbye Cruller World comes out. 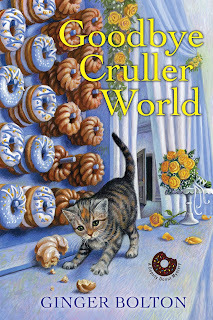 You can read about a deadly donut wall and how Emily and her friends help solve another murder. Read excerpts here. Find booksellers here. As Janet Bolin, Ginger wrote the Threadville Mysteries. It's National Library Week! 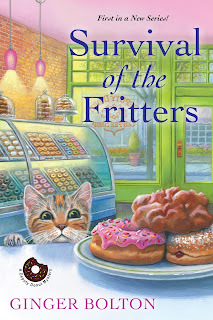 Tell us in the comments what library you think would like a print copy of Survival of the Fritters and bookmarks to go with it. A random number generator will help Ginger choose a winner. This is open to libraries in the U.S. and in Canada and to assisted living and hospital libraries. I am sure that Wolcott Public Library would love a copy. The Stone County Library in Mountain View, AR would LOVE a copy of "Survival of the Fritters" and bookmarks. Salem Public Library would love it! I don't see many mysteries on the "what's new" shelves anymore. They need to beef it up! My library already carries these books but I had to tell you that when I was in high school, my girlfriends and I used to try making elaborate desserts, from scratch. Good memories. My little town library would love a copy and some bookmarks. It's the Brookline NH Public Library. The Yankton Community Library, in Yankton, SD would like a copy of your book. dbahn(at)iw(dot)net. Thank you all for commenting. We do love our libraries! The winner is the Wainwright Public Library in Wainwright, Alberta, courtesy of Neena Luciow.